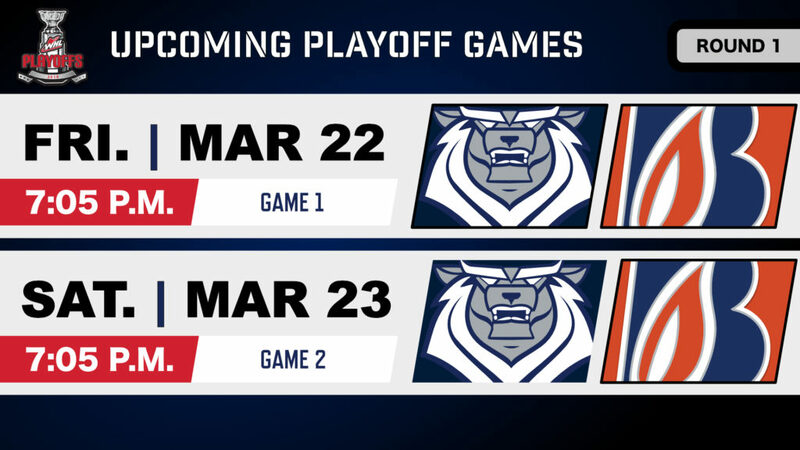 Victoria hosts Kamloops on Friday & Saturday to kick off Round 1 of 2019 WHL Playoffs. • Friday, Game 1 Tickets – bit.ly/2Fjwpft. • Saturday, Game 2 Tickets – bit.ly/2CoQEYE. • NHL Affiliated Players – Dylan Ferguson (Vegas), Jermaine Loewen (Dallas). • NHL Central Scouting Midterm Rankings (North America) – Quinn Scmiemann (ranked 71st among skaters). • Island Connections – Dylan Garand (Victoria), Sean Strange (Saanich), Dylan Ferguson (Lantzville). • Friday, Game 1 – The first 2,500 fans through the door will receive a Black and Blue Playoff Hockey Clap Banner presented by Dodds Furniture & Mattress, Gillis Plumbing, League and Williams Lawyers, and Victoria Hyundai. • Friday, Game 1 – Local country singer Bryce Allen will be performing live music, before puck drop, at Gate 1. • Friday, Game 1 – The Zone @ 91.3 will be doing a live broadcast from 4:00-6:45 p.m. outside at Gate 1. • Saturday, Game 2 – The Royals’ Team Store will be hosting a “Merch Madness” sale that includes discounts from 50% to 80% off on a selection of headwear and apparel that will be available to fans starting at 6:00 p.m. The sale will continue while quantities last or until the end of the third period. The sale will take place in the arena meeting room, just down from the Team Store near Gate 3. Fans are strongly encouraged to bring their own reusable bag to the sale. Paper bags & Royals’ branded reusable bags will be available for sale, while quantities last. All sales will be considered final and no discounts, coupons or returns will be allowed. Fans must have a game ticket to access the sale. • Single game tickets for the 2019 WHL Playoffs are on sale now at the Select Your Tickets box office located at Gate 1 of the Save-On-Foods Memorial Centre, over the phone by calling 250-220-7777 and online at www.selectyourtickets.com. Tickets for Royals’ playoff games start at $20.50 with discounts available for groups of eight or more. • Royals’ 2019 Playoff Ticket Packages are also on sale now. A $75 per-seat deposit not only locks in your favourite seat location at all home playoff games, it also provides a discount off standard ticket rates. For full details call the Royals’ Ticketing Office at 250-220-7889 or email them at tickets@victoriaroyals.com. • Friday, Game 1, First Intermission – Dodds Furniture & Mattress Trike Race – Three fans will race tri-cycles around the ice for a chance to win a great prize from Dodds Furniture & Mattress. • Friday, Game 1, Second Intermission – League and Williams Dash Cam Contest – A pair of fans will compete for a chance to win a dash cam courtesy of League and Williams Lawyers. • Saturday, Game 2, First Intermission – Lets make a deal presented by Gillis Plumbing – A pair of fans will select a mystery box for a chance to win a prize package, courtesy of Gillis Plumbing. • Saturday, Game 2, Second Intermission – Victoria Hyundai Trike Race – Three fans will race tri-cycles around the ice for a chance to win a great prize from Victoria Hyundai.